Long flowering, easy care Fuchsia Plants are available from wholesale growers in 100s of varieties from wholesale growers. The flowers are the main attraction, although many species have good foliage as well. Fuchsia are popular as garden plants, potted plants as well as in hanging baskets. Wholesale growers provide varieties suited to all of these applications. Generally sold as either potted specimens although sometimes pre planted in hanging baskets the range available is large. Most focus is on flower form and colour. Large flowers with good simple structure are always popular as are the colorful ‘double flowering varieties now available. Wholesale Fuchsia Plants are offered by growers, usually when in flower. However bulk quantities in tube stock to potted specimens for landscaping or growing on are also available. 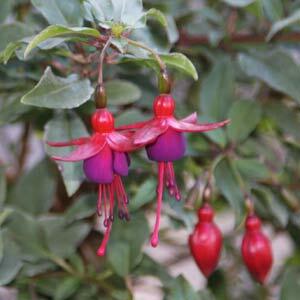 Some specialist nurseries offer a range of Fuchsia species, each with their own charm, many with great flowers. Upright of ‘Bush’ types for the garden and large container. Compact varieties best suited to growing in containers. Trailing types suited to hanging baskets and for planting along low retaining walls. Standards, occasionally some specialist growers will offer standards. Species Fuchsias. A number or rare plant nurseries offer species fuchsias.